Had the green fabric been wide enough, we would have made a comforter cover with just that fabric. But since it wasn’t, and we would end up with a seems anyway, we decided to make it a quilt. #1 and I got some girl bonding time and had a lot of fun finding fabrics that matched. Several trips to JoAnn and an online order (to supplement with enough green polka dot fabric for the back), and we were ready to go. And my girl could not be happier with the result! Next step is making 2 pillow covers, and I will of course write a post about those as well, once they are done. Going down one column, one square at a time, pin and sew the squares together (face-to-face) into long strips (.25” wide seams). Cut, pin and sew 2 pieces together (face-to-face). Iron. Pin and sew quilt and backer face-to face. leaving a 18” opening at the bottom. Hem the 2 sides of the opening. Using a knitting needle or chopstick, poke the corners from the inside to get them nice and sharp. Insert the comforter, make the bed, and watch you daughter’s big giant smile! Our comforter cover ended up about 64″ x 89″. Even though there is a standard size , that standard varies depending on who you ask, (66×90, 68×86, etc. ), and lots of comforters vary from that even . So I suggest you measure your comforter and size it to fit – that’s what we did. Instead of cutting the large pieces (for the back), I find tearing (thin) pieces of fabric works better to make sure the edges are straight. Make a little starter cut, then tear the rest. Important Note! 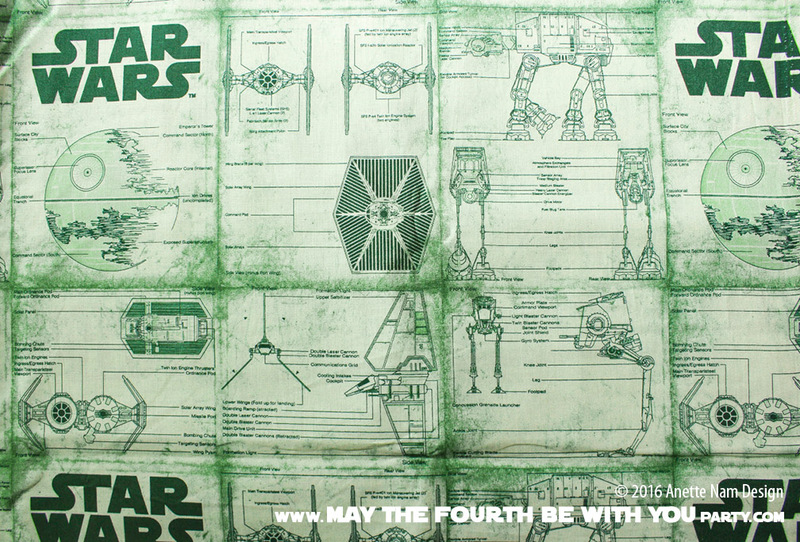 I am by no means suggesting that girls do not want, or shouldn’t get blue Star Wars sheets. Lots of girls love blue! My daughter, if we were painting her room today, would prefer a blue room, with matching linens. But since we are stuck (at least for the time being) with the color scheme she chose a few years ago, we had to get creative. One of the good things about JoAnn is they get new things all the time, but that also means that things don’t stay around for long. So I can’t find any of our fabrics there anymore. They have other Star Wars fabrics, but don’t go online, their store selection (at least at their larger stores) is much bigger. 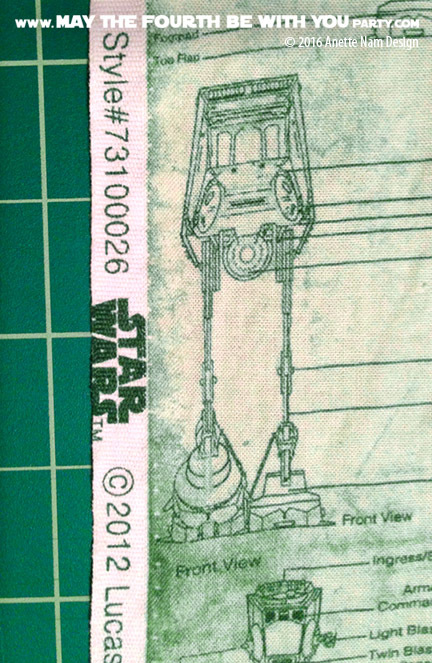 Amazon has an even a larger Star Wars Fabric selection (but it is of course much more fun to buy fabric in person). The Plush Clone Wars Yoda is from Target (2007). But it looks like they discontinued it. Try Amazon instead: Plush Yoda. Curtains: the sheers are from IKEA and the drapes are hand-made by M4P Mom with fabric from JoAnn (2011). The dresser is old and hand made. Most of the pillows and other quilts are purchased from Marshall’s, TJ Maxx and Home Goods at random times in the past few years. The pink rug is hand-woven by M4P Mom. The wooden dessert tray was a gift, and I am not sure where it is from. And if you want to BUY sheets, I am happy to say both Pottery Barn Kids and Amazon now have bed linens that are dark grey, or contain A LOT of white… but still nothing green, purple or pink! Atta girl! You saw a problem and you fixed it with your awesomely mad skillz! Wow, I love this! My sorority colors were pink and green, too, so I think this is just perfect. 🙂 What a great mom-daughter activity. Thanks! We had such a marvelous time choosing the fabrics.